I love seeing everyone's wip & fo! Thanks to all the good advice, I've added the 5th lace repeat, and plan to make the stockinette section a bit longer too. I haven't taken it off the needles, but width seems okay. Now that I'm onto straight ss, this project is ready to get on the plane with me this Saturday to visit family and friends in Ohio/Michigan. Does anyone have an opinion on yardage: it took 1 skein = 4 lace repeats of size small, so that leaves 1 skein for the fifth repeat and all the stockinette. Do you think I should pick up another skein before I go??? honestly, if it were me, I'd be sufficiently nervous to pick up the extra skein, and just hang on to my receipt. 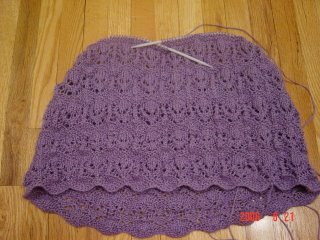 The stockinette will probably take up more yarn than the lace. I used up the same as you, BTW - joined my second skein right on the last line of the fourth repeat. I'm making the 39" size and started my second skein on round 12 of the 4th lace repeat. After BO the front, I had about 2 yards left. So, I started my third skein when rejoining the yarn on the back. It looks like I'll have enough to finish with 3 skeins total. It's better to be safe than sorry and take your 3rd skein w/you. Murphy's Law dictates you'll run out of yarn before finishing if you don't take the extra skein. St st always takes more yarn than lace in general, right? Drat, you've probably already left... Well, if you haven't ordered that third skein yet: definitely ask in the comments section of the order form if they can match the dye lot. When I was running out of yarn for my Banff (I ran out twice... that should have made me suspicious), I asked this online yarn store if they could match it. Didn't really expect them to be able to, but they did. Good luck with your yarn quest, your work looks awesome so far!